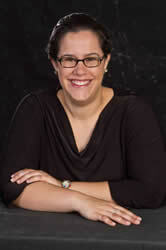 Jessica Helms, staff accompanist for the California Lutheran University Music Department, accompanies the university choral ensembles, including Areté, CLU’s professional vocal ensemble, and accompanies and coaches many of the department’s vocal students. She is also music director and organist of College United Methodist Church of Ventura, accompanist and assistant artistic director of the Gold Coast Concert Chorus, director of Las Voces del Mar, the women’s chorale associated with the Pacific Shores Philharmonic Foundation, and on the board of the Ventura Chapter of the American Guild of Organists. She graduated from California Lutheran University with a BA in Piano and Oboe and has done Master’s work at Westminster Choir College in Princeton, New Jersey, where she studied with J.J. Penna and Dalton Baldwin She is currently working towards a MM in Choral Conducting at California State University, Los Angeles. Jessica has accompanied for many choirs, ensembles, and soloists at various Ventura, Santa Barbara, and Los Angeles County locations including Newbury Park High School, Ascension Lutheran Church, Our Redeemer Lutheran Church of Oxnard, the Geraldine Decker Vocal Studio, Camarillo Community Theatre, All Saints by the Sea of Santa Barbara, CSULA, and Ventura College. She has had the opportunity to perform across the country and throughout Europe, as well as work with many leading artists in a master class setting including Jo-Michael Scheibe, David Lang, Libby Larson, Emma Johnson, and Daniel Beckwith.